Contrary to popular belief, adding supplements to your diet doesn’t give you the green light to stop eating healthy. In fact, some all-natural supplements have actually proven to be more effective when combined with fresh foods. The results of such a scientific study were published in a prominent medical journal a couple years ago in an article titled, “Sulforaphane Absorption and Excretion Following Ingestion of a Semi-Purified Broccoli Powder Rich in Glucoraphanin and Broccoli Sprouts in Healthy Men.” Basically, these researchers at the University of Illinois concluded that the combination of broccoli powder and fresh broccoli sprouts is healthier for the human body than either product standing alone. When broccoli sprouts are prepared with all-natural broccoli powder, the body is able to absorb the nutrients more effectively and reap the maximum benefits of this super food. No nutritionist would ever deny the health benefits of broccoli, whether in vegetable or powder form. In fact, it packs more of a nutritional punch than nearly any other vegetable in the market. 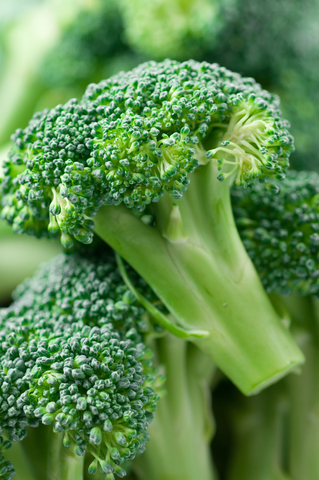 Broccoli contains lots of Vitamin A, Vitamin C, folic acid, calcium, and fiber. Because of the calcium content, broccoli is a great vegetable for lactose intolerant folks to eat because it promotes strong bones and healthy blood pressure. Not only is broccoli a rich source of fiber, but most of its fiber is soluble, which helps your body digest everything you put in it. Pretty much everyone’s body could use some detox, and broccoli has three different kinds of glucosinolate phytonutrients that supports the activation, neutralization, and elimination of unwanted contaminants. Even if you’re convinced about benefits of supplement-vegetable combinations, you’re probably wondering how exactly to incorporate it into your dinner menu. In the aforementioned study, testers sampled four dry cereal and yogurt meals with 2 grams of broccoli sprouts and 2 grams broccoli powder. You can also mix 1 or 2 tablespoons of broccoli powder with your favorite recipes that already have fresh broccoli powder in them for added flavor and nutritional benefit. And if you’re really not into cooking at home, you can always add a couple tablespoons of broccoli powder to your fresh squeezed or juice or your fruit or vegetable smoothie. Fortunately for those of us who loathe the taste and texture of broccoli, our own Seagate broccoli supplements make it possible to reap its health benefits without cringing or bringing up repressed childhood memories. And for those who already eat broccoli on a regular basis, this is a way to make a great vegetable even better. Deny it all you like, but here’s no denying that your parents were right about this powerful vegetable!